A safari is on a lot of bucket lists - it was certainly on mine! - but by the time we have the money to take one, many of us fear we won't be physically up to the challenge. Sabi Sabi, where I went, may mean "fear fear" in Zulu, but don't: YOU CAN DO IT. You just have to choose your safari camp more carefully. Safaris come in all styles - horse or elephant back, by plane or boat, with camps as portable as large mobile homes but that move each day or so and those that are permanent from which you venture out on "game drives". None are cheap but it is a trip of a lifetime. There are four camps within the Sabi Sabi family and each caters to different tastes. 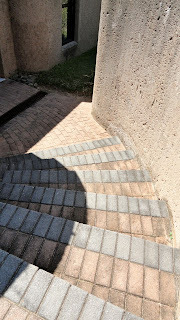 Bush Lodge is the largest, has an EleFun Centre and program for children and is virtually step free. The only ones you have to navigate are up to the "mounting block" to make getting into and out of a Land Rover easier. Each of these comes with a ranger and tracker who are accustomed to helping guests handle the high-off-the-ground vehicle. Bush is designed to reflect the Africa of today and features a great deck overlooking a popular watering hole where you can sip a good South African wine while watching the wild ones - including a pair of Cape buffalo - sip their beverage of choice. Little Bush Camp is the smallest and most intimate but comes with a few more steps, especially across a river to the pool. 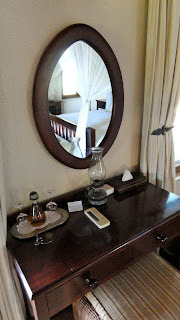 Selati Camp is designed for the Africa of yesterday experience. Romantic paraffin lamps and lanterns sub for electricity whenever possible and the aura is one of fin de siecle Out of Africa. 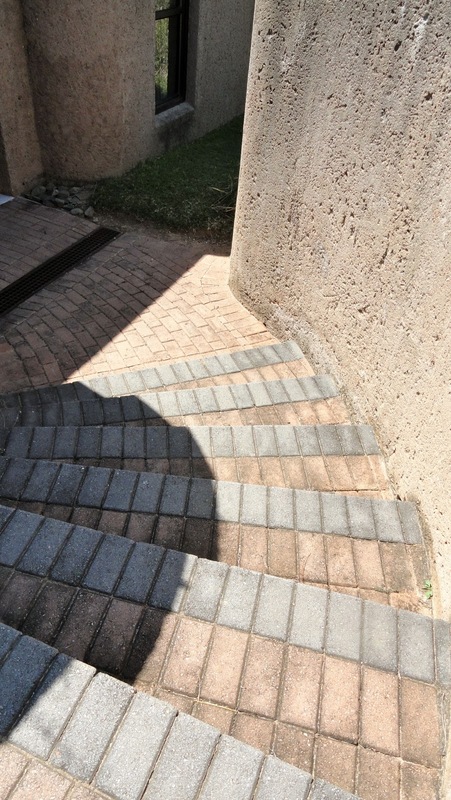 Steps are relatively few here. Earth Lodge, where I stayed, is the safari camp of the future, so ecologically harmonious with its surroundings you don't see anything but bush and hillocks when you drive up. Evening lighting is motion-sensitive, decor is African contemporary with wondrous furniture made by a South African artist from trees washed up by the river or pushed down and killed by elephants. It also has one of the best wine cellars in the bush. Tip: There are no steps here either unless you count the few down to your suite and the one into your private splash pool. 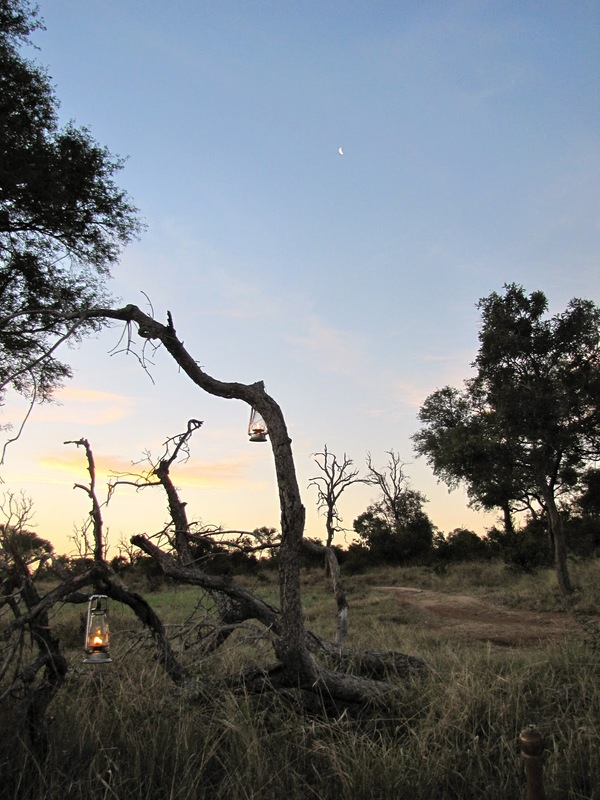 All camps are in a large private reserve that abuts the Kruger National Preserve. We saw four of the "big five" during our first game drive. You can set your own schedule, but morning begins before dawn if you want to see the most wildlife. Return late morning, lunch, leisure, perhaps a nap or spa treatment and then it's tea and the afternoon drive. Tip: Except for a coffee break in the morning, sundowners (cocktails) in the afternoon and an occasional dinner in the bush, you will stay inside the Land Rover, so strenuous walking is not a problem. The food is so good and comes so frequently you will think you are being fattened up for the animals' dining enjoyment. Not to worry. Your only problem will be not wanting to leave. 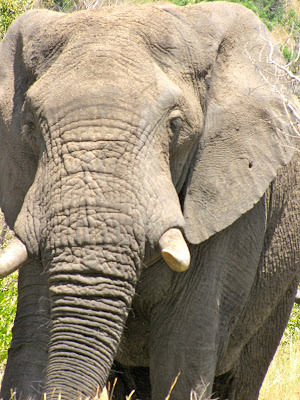 Find out more about the Sabi Sabi camps at www.sabisabi.com. The longer I was on Nieuw Amsterdam the more I liked her. 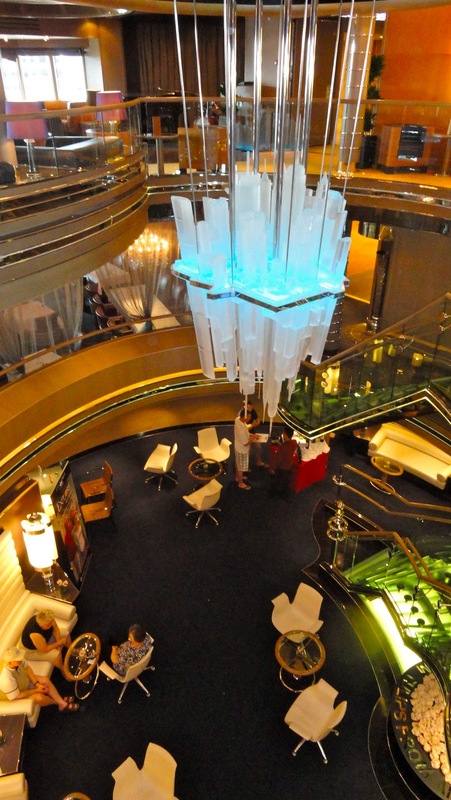 Without the cavernous atrium of many new mega ships, there is plenty of room for interesting spaces such as the piano bar and Crow's Nest lounge, library and internet cafe. You will find good art and antiques incorporated into the decor which is never glitzy. Tip: Levelers, decide what your favorite activities will be and select your cabin location accordingly. 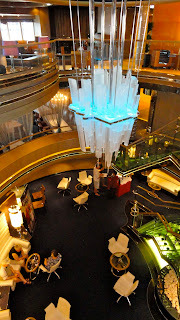 Main dining room and Lido buffets are aft; specialty restaurants and midships; casino just forward of midships, show room, spa, Crow's Nest, front office, excursion desk and disembarking at ports are forward; family pool forward, adult pool aft. Don't worry about which deck; there are ample elevators for the 2,094 passengers who might be on board. Biggest design flaw: Lack of raked seating in the main and smaller show rooms. Tip: Sit in the back. What surprised me most: The number of infants and toddlers along and how well behaved they were, even at dinner. What didn't surprise me: I never won at bingo. Should have expected: The glorious floral arrangements - pots of live orchids on all the tables in the Lido dining spaces and the mass of pink-tinged creamy white tulips between the front and excursions desks. What dismayed me most: The sanitizing of port stops, especially at Grand Turk and Costa Maya, and the tendency to keep passengers isolated from the real life around them. The brightly painted, hyper-festive cruise ship compound at Costa Maya, Mexico, was as much like a Mexican town as the pizza parlor in the Italian section of Disney's Epcot is like Naples. There was a town off in the distance but the configuration of the "port" made it very difficult to reach. Guess I'm just a grouch, though, because most passengers seemed to love the swim up bar, shopping and over-priced tequila drinks. What tickled me most: The silky smooth feel underneath sting ray wings and the wildly beautiful coral near the Cayman Wall in Georgetown, Grand Cayman. Would I do it again? What, seven days at sea in elegant surroundings with hot and cold running service, excellent food and more than the comforts of home? You have to ask? Oh, yes, do throw me in that oceanic briar patch! Bon voyage on your next cruise from our jolly little group! Well, gang, I had planned to blog each day of my journey aboard Holland America's Nieuw Amsterdam, but the promised free wi-fi was not delivered and at the cost per minute aboard, this is the one and only post. The ship is beautiful. 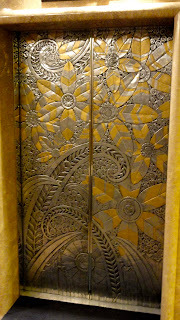 Tastefully appointed and comfortable, even the elevator doors are works of art. Speaking of which, the works for sale in the "art" gallery are as much schlock as any other lines but at least passengers are spared the hyped champagne auctions. Tip: Levelers, you will find the step up to the cabin bathrooms are lower than on most ships. The crew is friendly if sometimes inept and room service doesn't always send what you ordered. Some of the hairdryers don't work and I've seen many passengers returning again and again trying to get room/charge cards that work. A real pain because you can't do anything aboard without one. P.S. Don't know how this underlining began but I can't seem to stop it. So sorry. Yesterday we were on the line's private island, Half Moon Cay, into which they have sunk a ton of money. Beautiful beach and great infrastructure. Today it's Grand Turk for 5 hours which, having been there, is enough unless you're kicking back for a week. Fascinating history but not much to see other than the conch farm although the Conch Shack should be listed by Zagat's. Bye for now and for probably another 2 weeks. I return home for one day before heading off to South Africa. Packing so light for that no room for laptop. But boy will I have lots to blog about when I reurn! It just cost $2 of wi-fi time to download one picture so no more of those either.